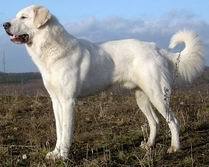 A rare and elegant breed, the Akbash breed originated 3000 years ago in Western Turkey. Developed by shepherds as a livestock guardian, the Akbash was bred selectively for the white coloring so as to be discernible from predators. This breed was introduced into the United States during the 1970's and recognized by the UKC in 1998.